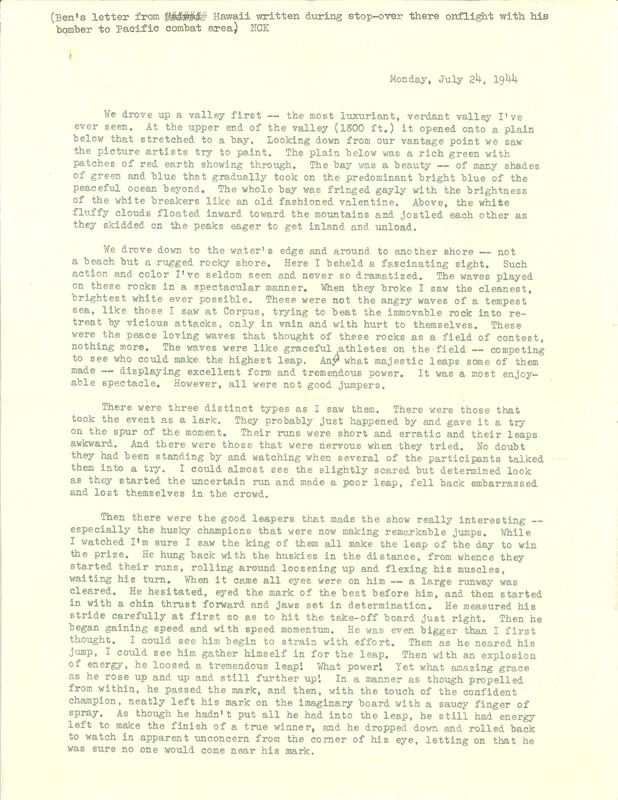 (Ben's letter from Hawaii written during stop-over there onflight with his bomber to Pacific combat area) NCK Monday, July 24, 1944 We drove up a valley first the most luxuriant, verdant valley I've ever seen. At the upper end of the valley (1800 ft.) it opened onto a plain below that stretched to a bay. Looking down from our vantage point we saw the picture artists try to paint. The plain below was a rich green with patches of red earth showing through. The bay was a beauty of many shades of green and blue that gradually took on the predominant bright blue of the peaceful ocean beyond. The whole bay was fringed gayly with the brightness of the white breakers like an old fashioned valentine. Above, the white fluffy clouds floated inward toward the mountains and jostled each other as they skidded on the peaks eager to get inland and unload. We drove down to the water's edge and around to another shore not a beach but a rugged rocky shore. Here I beheld a fascinating sight. Such action and color I've seldom seen and never so dramatized. The waves played on these rocks in a spectacular manner. When they broke I saw the cleanest, brightest white ever possible. These were not the angry waves of a tempest sea, like those I saw at Corpus, trying to beat the immovable rock into retreat by vicious attacks, only in vain and with hurt to themselves. These were the peace loving waves that thought of these rocks as a field of contest, nothing more. The waves were like graceful athletes on the field competing to see who could make the highest leap. And what majestic leaps some of them made --- displaying excellent form and tremendous power. It was a most enjoyable spectacle. However, all were not good jumpers. There were three distinct types as I saw them. There were those that took the event as a lark. They probably just happened by and gave it a try on the spur of the moment. Their runs were short and erratic and their leaps awkward. And there were those that were nervous when they tried. No doubt they had been standing by and watching when several of the participants talked them into a try. I could almost see the slightly scared but determined look as they started the uncertain run and made a poor leap, fell back embarrassed and lost themselves in the crowd. Then there were the good leapers that made the show really interesting especially the husky champions that were now making remarkable jumps. While I watched I'm sure I saw the king of them all make the leap of the day to win the prize. He hung back with the huskies in the distance, from whence they started their runs, rolling around loosening up and flexing his muscles, waiting his turn. When it came all eyes were on him -- a large runway was cleared. He hesitated, eyed the mark of the best before him, and then started in with a chin thrust forward and jaws set in determination. He measured his stride carefully at first so as to hit the take-off board just right. Then he began gaining speed and with speed momentum. He was even bigger than I first thought. I could see him begin to strain with effort. Then as he neared his jump, I could see him gather himself in for the leap. Then with an explosion of energy, he loosed a tremendous leapl What power! Yet what amazing grace as he rose up and up and still further up! In a manner as though propelled from within, he passed the mark, and then, with the touch of the confident champion, neatly left his mark on the imaginary board with a saucy finger of spray. As though he hadn't put all he had into the leap, he still had energy left to make the finish of a true winner, and he dropped down and rolled back to watch in apparent unconcern from the corner of his eye, letting on that he was sure no one would come near his mark.